Should You Get an EPDM Roof? We Install, Repair, and Replace EPDM Roofs! Commercial roofs need to be durable to handle all the high traffic, large space, heat, and chemicals it has to cover and endure throughout its lifespan. 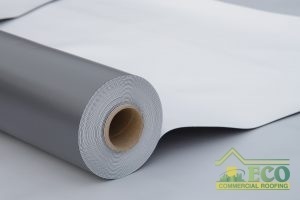 The best roofing systems for commercial roofs are rubber singly ply membranes. They are thin, durable, waterproof, and reflective and last for 20 or more years before needing repairs or replacing. Sometimes you can extend it for another 20 years by getting protective coatings applied on top of the rubber roofs. Commercial roof coatings help protect your business’s roof, and can be applied over any type of roofing system, from a Conklin EPDM roof to a metal roof. One of the best single ply commercial membrane roofing materials are EPDM roofs. For EPDM roofs installation in Texas, Louisiana, and Mississippi, TX, call ECO Commercial Roofing at (833) 200-0571 today. Easy to Install: EPDM roofs are sheets of rubber roofing that are rolled out and then welded together for a seamless and quick finish. Reflective: The white coating reflects the sun, cooling the roof and therefore cooling the inside of the building. As the building is cooler, HVAC systems don’t have to work as hard and energy bills are dramatically reduced. Eco Friendly: EPDM roof installation is good for the environment as it reduces roofing landfill waste. Roofs make up 20% of landfill waste, but these seamless sheets don’t leave large messes behind when it is time to be replaced. Resistant: EPDM roofs are waterproof, won’t get damaged from any type of storm, and are even fireproof! They won’t melt under high heat or chemicals and the seamless roof will not tear, meaning leaks are impossible! Posted in Uncategorized on October 12, 2018 at 7:32 pm by ECO Roofing.